“Man up!” That command may stiffen the spines of soldiers hauling heavy packs on grueling training hikes, but it’s not so helpful for veterans hauling the heavy weight of grief. Tom Edwards, left, has found the veterans support group led by Mike Goodwin offers compassionate camaraderie. “The military trains you to keep moving, to just deal with it,” said Mike Goodwin, a U.S. Air Force veteran and NorthBay Hospice & Bereavement volunteer. But, for some veterans who have lost a loved one, the weight may be too much to bear. That’s where having another veteran to stand by and help through the dark days has proven to be helpful for the participants in NorthBay Hospice & Bereavement’s Veteran Men’s Support Group. Mike knows. He lost his son in a car accident 11 years ago, and spent seven years in emotional lock-down, unable to process his grief. Then, five years ago, he saw an advertisement for NorthBay Bereavement’s eight-week “Journey Through Grief ” program and it clicked: The time had come to face his sadness head-on. 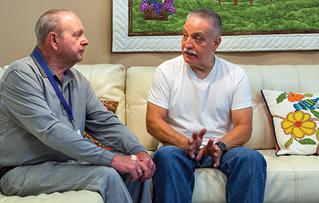 Through the program, Mike found the courage to face feelings he had shuttered away, and then became determined to turn his son’s death into renewed purpose for life. He signed up to be trained as a hospice and bereavement volunteer and now he regularly meets one-on-one with those who are in deep grief. He also helps facilitate the “Journey Through Grief ” program, and volunteers at the NorthBay “Tree of Memories” event. Then, when NorthBay Hospice decided to form a Veteran Men’s Support Group two years ago —as part of its commitment to the “We Honor Veterans” program —Mike was the natural choice to help get the group going. The original group has grown to a steady following of 13, representing all branches of the military except the Coast Guard. Some have been coming since Day 1, while others graduated from the bi-weekly meetings. Tom Edwards is a veteran-turned-volunteer, who joined the group about a year and a half ago, after his wife passed away. “It was very helpful to hear others who are in different stages of their grief process beyond where I am, because it gave me hope that I could get there, too,” Tom said.